A selection of home-made refreshments will be available and there will an opportunity to speak with representatives from the Parish, District and County Councils and from local groups and organisations and view the exhibition area. For the minutes of last year’s meeting, please scroll down to the end of this agenda. Councillor Rowland Hibbard (Chairman, Broadwindsor Group Parish Council), Mrs. Janet Tubridy (Clerk to the Council/outgoing), Mrs. Helen Cudmore (Clerk to the Council/incoming), Councillor Jacqui Sewell (West Dorset District Council). Refreshments were served prior to the formal meeting. The meeting was chaired by Councillor Hibbard, there were thirty seven people in attendance including Members of the Broadwindsor Group Parish Council (BGPC) and members of the public. The meeting was formally opened at 7.53 pm. Apologies for absence were received from Councillor David Chumbley, Councillor Rebecca Knox and PCSO Alex Bishop. A copy of the minutes from the Annual Parish Meeting held on 5 March 2014 as previously circulated were confirmed as a true record and signed by Councillor Hibbard. Councillor Hibbard opened the Meeting by welcoming everyone to Blackdown Village Hall and thanked them for attending the Annual Parish Meeting. He personally thanked Mr. Rovan Wickremasinghe from the CAB for agreeing to present an overview of the Bureau’s role and work in the community and also thanked members of the Blackdown Hall Committee for hosting the evening and providing refreshments. With regard to local roads, Councillor Hibbard reported that during the last year much work had been completed with the resurfacing of the B3165 from Hornash to Oathill and the B3165 from Hornash to the border with Somerset at Winsham. He stated that the Parish Council remains relentless in its objective to ensure that those roads which are still in need of improvement, are brought to the attention of the relevant statutory bodies. Councillor Hibbard was pleased to announce that the much sought after 20 mph speed limit through Broadwindsor is now going through the required legal process and it is hoped that this will be in place by Autumn 2015. He thanked all those who have worked tirelessly to achieve this. Councillor Hibbard also referred to Kittwhistle and Blackdown, noting that although there is no reduced speed limit, improvements have been made at the Kittwhistle pinch point and it is hoped that warning signs will be in place later this year. He thanked local residents who have campaigned for these safety improvements. The Parish Council considers applications for financial support from a range of different bodies including Village Halls, the Allotment Committee and First Responders in addition to organisations such as the Citizens Advice Bureau. At last year’s meeting Councillor Hibbard reported that the Parish Council was supporting Upper Marshwood Vale Parish Council in their efforts to obtain funding from DEFRA to ensure that full broadband access was rolled out across this part of West Dorset. Councillor Hibbard was pleased to update that funding has now been approved and that the Parish will be able to take full advantage of the improved network. Councillor Hibbard made reference to the Community Shop which has just completed its second year of trading, stating that it is a real asset to the community. He thanked the Committee, the many volunteers who run the shop and the Manager and staff for their considerable efforts. Another valuable community asset for the Parish are the First Responders, Broadwindsor Responders are currently not fully manned so can only offer a limited response, however there is a defibrillator at Kittwhistle Garage which is available twenty four hours a day. Councillor Jacqui Sewell commented that First Responder training will be taking place within the next three months and if anyone is interested they should contact her. The Council is also active and engaged in local planning. When the Parish Council receives a copy of a planning application, they forward it to the Councillor most local. They immediately contact neighbours and those people who might be affected by such a development and listen to any concerns. Comments received are then sent to the Planning Office at West Dorset District Council (WDDC). In the last year Councillors have attended planning meetings at WDDC to personally give Parish Council support. The Parish Council is also working hard to improve the facilities for young people in the area with financial support being given for new play equipment in Drimpton, for improvements planned for Bernards’ Place and for the proposed play area by Broadwindsor School. Councillor Hibbard noted that Drimpton which has an active Youth Club is progressing well with their improvements. He concluded by reiterating the importance of encouraging and retaining young people in the area. Councillor Hibbard urged people to come along to the Neighbourhood Plan meeting being held on 7 April at Drimpton Village Hall. A Neighbourhood Plan should in theory grant the Parish the power to put aside land which could be used for future development and also protect land which the Parish would not wish to see developed. Councillor Hibbard reported that in addition to the General Election on 7 May, there will also be District Council and Parish elections, anyone wishing to stand must have their nomination paper in by 9 April. Councillor Hibbard paid thanks to all Members of the Parish Council for their hard work during the last year, which is given for no recompense and encouraged more people to attend the monthly Council meetings. He also thanked the District and County Councillors for their help and assistance. Closing his report, Councillor Hibbard made reference to the retirement of Councillor Fraser Hughes after six years on the Council, noting of his many achievements, the Village Shop. He thanked Councillor Hughes for his dedication and hard work and wished him well. Councillor Hibbard also reported that after serving for thirty two years as Parish Clerk, Mrs. Janet Tubridy was also retiring. Mrs. Tubridy has a wealth of knowledge of the places and history of the Parish and on behalf of the Council and parishioners he thanked her for her dedicated service and presented her with a gift. Members of the audience gave a round of applause in appreciation. On behalf of PCSO Alex Bishop, Mrs. Janet Tubridy presented the Community Beat Officer Report. Since the beginning of the year crime in the area has been fairly low and the Report highlighted six recent incidents. The Police can offer crime prevention advice and also ask people to remain vigilant and report any suspicious activity by telephoning 101. It was noted that if you are reporting an incident, do not call Beaminster Police Station. The PCSO’s Report also noted that there has been a rise in the number of telephone scams reported to the Police, with people purporting to be from a bank/building society asking for bank details such as PIN and account numbers to verify who they are speaking to. They may also try and arrange for someone to collect the expiring bank card, which they then use with the details they have obtained. The Police advise that you should never give your PIN or bank details out over the phone, never withdraw cash and send it anywhere via a courier or taxi and never send bank cards anywhere via a courier or taxi. If anyone is interested in joining the Home Watch scheme, or receiving messages, you can register your details at http://www.dorsetalert.co.uk Police surgeries will be held in the Comrades Hall on Tuesday 14 April and Tuesday 12 May, at 10.30 am. Mrs. Janet Tubridy presented an update from the FMR Trust. Grants totalling £1580 have been awarded to Bernards’ Place for grass cutting and a ROSPA inspection and to Broadwindsor Cricket Pavilion. The present balance is £4069. On behalf of Mrs. Angela Frampton, Treasurer of the Blackdown Educational Trust, Councillor Hibbard presented this Report. The Trustees received eight requests for funding, five grants of £80 were awarded to young people in Thorncombe and two grants of £80 were awarded to young people in Broadwindsor, totalling £560. A request for applications for 2015 will be advertised during June and July with a deadline in September for submission. The present balance is £246. Mr. John Hansford presented this Report. The Sick Poor Fund supports people with health problems. The Fund has been very active again this year with £900 of grants being awarded. Full details will be provided in next month’s Broadwindsor Parish News. Mr. Chris Newall, Chairman of of the Comrades Hall Management Committee presented this Report. He noted that the Hall very much remains an integral part of the village infrastructure, being both structurally and financially sound. Hiring fees have not been increased this year and have actually been reduced for coffee mornings. There has been an increase in bookings, with regular income being received from a company using the foyer for newspaper sorting. This has resulted in a small surplus for this year, as against a significant deficit for the year before. Mr. Newall was pleased to report that with financial support from Awards for All, the Hall now has its own cinema, which will provide for greater control over future screenings. With regard to Bernards’ Place, Mr. Newall informed that the District Council had queried its ownership and refused to empty the bin, this situation is currently in the process of being resolved. He confirmed that the responsibility for Bernards’ Place rests with the Comrades Hall Management Committee. The Parish Council has earmarked funds for replacing the train in Bernards’ Place and the Committee is currently canvassing the community for their thoughts on a replacement. To conclude the Report, Mr. Newall thanked all members of the Committee for their hard work. Councillor Hibbard presented this Report. A fundraising committee has been formed charged with raising money towards an extension to the kitchen. It is hoped that by having improved catering facilities, the Hall will attract more users and a wider variety of events. Plans are currently being drawn and estimates are being sought for building works and kitchen equipment. Councillor Hibbard thanked the Parish Council for the twice yearly allocation of £500, stating that such financial assistance enables the Hall to survive. Fundraising events are being held throughout the year, the next being on 25 April. A new noticeboard has been erected in the entrance hall, special thanks was given to Peter Hardwill and Phillip Bailey for helping with this and for all they do for the Hall. The Report concluded by thanking members of the Village Hall Committee, the Secretary Treasurer, friends and family for all of their efforts and for giving their time so generously. Councillor Mike Saunders, Chairman of Drimpton Village Hall presented this Report. He informed the Meeting that compared to other years, last year was a relatively restful period for the Hall, as the previous three years had been busily spent refurbishing the Hall in time for its anniversary in 2013. The financial balance at the start of the year was £3600 with a yearend balance of £3560. Councillor Saunders stated that he was very grateful to the financial contribution from the Precept which they had used to significantly improve facilities for children. Councillor Saunders was pleased to report that Drimpton had also received £10,000 from Awards for All for the extension to its play park and it is hoped that this will be completed in May 2015. The Village Hall Committee had also applied for a solar panel grant, a decision is awaited. The Report concluded with Councillor Saunders giving thanks to the Parish Council and to the public for their continued support. Mr. Eddie Gerrard presented this Report. Broadwindsor Primary School now has the largest intake of children it has had for decades, with music and sporting activities being identified by the Governing body, as its specialist areas. Currently, the tarmac area is being modernised and it is hoped that the Parish Council may be able to support the development of the playing fields. Mr. Gerrard noted the wish for an all-weather pitch which would not only be used by the School but also offered to the wider community of Broadwindsor. At present the School offers a diverse range of sporting opportunities including archery, football, rugby and hockey and pupils have recently been motivated by a visit from an Olympic medallist who encouraged them to take up gymnastics. Mr. Gerrard also noted the School’s passion for music, with approximately 80% of pupils being involved with music in some shape or form. Recently the School Choir with music teacher Mrs. Killick performed at the ‘Young Voices’ event in Birmingham which was a wonderful experience for all involved. Pupils have also entertained the elderly in Comrades Hall and Broadwindsor House and presented a well-received Christmas show. The Report also highlighted that Teachers and Assistants were being supported by Mr. Arnold in implementing the new curriculum, which introduces new ways to measure pupil progression. There are currently twelve children who are recorded on the special needs register, the School has recently appointed a Special Educational Needs Co-ordinator and two additional Teaching Assistants to ensure that children are given the help they need. This will be aided by the recent introduction of the Government‘s Pupil Premium, approximately £1500 per eligible child. Mr. Gerrard was pleased to report that the School has gained an outstanding result in the Keeping Children Safe Audit. With regard to other activities, the Young Shakespeare Company has recently visited the School, and a number of pupils were given the opportunity to take part. This proved a great experience for the children. Due to the introduction of hot meals for all children up to Key Stage 2, the School has purchased a new larger oven and can now provide between fifty five and sixty hot meals a day. In addition, the toilets have been refurbished and the central heating boiler has been replaced. Mr. Gerrard also reported that the School’s Governing body has been reconstituted as required by law, there are now 10 Governors. Councillor Hibbard asked for thanks to be passed on to the Head, Mr. Arnold. Councillor Andrew Frampton, Director of Communications at Broadwindsor Cricket Club presented this Report. A number of changes are currently underway, the Pavilion now has running water, and funding has almost been secured for the toilets. Councillor Frampton noted that within the next twelve months, the Pavilion and grounds will be available for use by the wider community including the School. The Club has been raising funds by selling boundary boards, which are priced at £100 each. On the pitch, the Club’s Sunday side has won the league – the third time in two years, and there is also a strong and active Saturday side. The Club is thriving, in total 500 players used the grounds during the last season and many thanks must go to the Club’s Captain Adrian Phillips. Councillor Fraser Hughes presented this Report on behalf of Councillor David Leader. Councillor Hughes informed that Hursey Common is managed by the Parish Council and the football field, which is largely self-funded is currently managed by a team of volunteers. The Parish Council has asked Dorset Wildlife Trust to survey the wild flower area and prepare a ten year management plan for the Common. The survey and all costs to date have been paid for by the AONB with no cost to Parish funds. Only trees which are dangerous or diseased are being felled and anyone helping with the work can take away the wood which has been cut down. The Plan is available to view on the Broadwindsor website, paper copies can be obtained from Councillor Leader. In her absence, Councillor Jacqui Sewell presented a report from Councillor Rebecca Knox. The past year has seen huge change within the County Council with restructuring of Departments which have led to a decrease in numbers of staff and changes to top teams which have seen the number of posts being cut. The aim behind this is to put in place teams which can focus on what residents really want, rather than what might have been in the past. The greater use of new technology means that those working out in the field, like on highways matters, no longer have to return to a place of work to get a request for something being done ordered – that officer can now do this from the site and then go direct to the next, saving a huge amount of time and money. This is not just the case for highways, it’s happening for services for families and children, adult social services and public health. The County Council is putting together a three year plus plan on how to spend its budgets, not just working from year to year. The emphasis is more on using personal budgets for residents rather than the Council telling people “this is the service” – the change should mean that residents with personal budgets can have more choice which suits them. There is also a holistic transport review underway – for instance buses are not the only form of transport that the Council pays for, there are other forms which service adults and children’s services, the Council want to see if the whole mix can be used to support residents’ needs. Superfast Broadband is being rolled out, with the aim of 97% by end of 2016. The other 3% is incredibly important to achieve too and the Council is also focussing upon that. There is pressure on primary school places – this is evident nationally and is reflected in West Dorset. School investment in ensuring that there are places locally remains a priority for the Council. Affordable housing need is key too – to keep young people living and working in Dorset. Councillor Knox is available via email or telephone and attends Parish Council meeting as often as she can. Councillor Knox very much believes that the County Council is moving in the right direction of becoming more demand focused rather than trying to do everything for all, which the all might not necessarily want or need in this day and age. Councillor Hibbard made reference to the information which was available to view on the display tables in the Village Hall. There were no questions. Councillor Jacqui Sewell presented this Report. West Dorset has one of the lowest Council Tax rates in the country, with a modest 1.9% rise from last year, bringing the total income to £5,259,000. Only 8% of this is retained by the District Council. Part of this share is used to assist Community Shops by paying their contribution of business rates. Parking charges remain frozen again, equating to nine years without an increase. Councillor Sewell reported that the District Council was positively tackling the continuing financial squeeze, it is expected that there will be £9million less to run services with by 2020, but with prudent budgeting, the Council still continues to provide all essential services as well as supporting local museums and tourist information services. With regard to the Localism Act, Councillor Sewell informed that there have been many problems with the ‘community rights to bid, build and challenge’. She is seeking an increase from six to nine months in terms of the time to bid to buy a local asset and make ‘intent to market’ to ‘on the market’ or ‘actively marketed’. She also wishes to make it easier to remove/restrict the ‘permitted developments’ exemptions from planning control when an asset of community value has been listed. Councillor Sewell also wants people to have more input over what happens to local land, buildings and services and include the ‘community right to build’ procedure into the larger Neighbourhood Planning process. Focusing support on building local people’s skills to manage projects through models such as Community Land Trusts was also highlighted. The District Council is currently consulting on modifications to the new Local Plan and on the new household projections published by Communities and Local Government. The deadline for public comments is 8 May 2015. Two issues which were put forward by Councillor Sewell have been included in the new Local Plan, the re-use of redundant farm buildings and the protection from development of arable land for food production. Councillor Sewell concluded that she continues to be available to people within the District Council area, to help with issue and problems, noting for example, planning, benefits, healthcare, housing, transport and fly tipping. A number of questions were asked of Councillor Sewell. The continuing problem of fly tipping at Netherhay was raised by Councillor Frampton, asking whether it would be possible for covert filming equipment to be installed in order to identify those responsible. Councillor Sewell confirmed that the landowner would be permitted to do so. Councillor Mike Saunders asked why West Dorset was not included in the map of play parks on the Dorset for You website, Councillor Sewell stated that she was not aware of its omission and would make enquiries and report back. In the absence of Mrs. Jean Frampton, Councillor Jacqui Sewell presented an update. The Post Office in Broadwindsor which was established five years ago continues to thrive, offering a full service including taxation and passport applications. An outreach service for Thorncombe is soon to be offered. Councillor Jacqui Sewell presented an update. There are currently only three First Responders, the new Co-ordinator Mr. David Towman wishes to increase numbers and encourages anyone interested in taking part in the upcoming training to get in touch. Mr. Rovarn Wickremasinghe, Manager of Bridport and District CAB presented an overview. The CAB is a charitable organisation which works to ensure that people are not disadvantaged through ignorance of their rights. It is funded by West Dorset Council, with some funding from partner organisations such as Wessex Water. The CAB relies on volunteers to deliver the service, currently they have eighty and several paid staff. The CAB is open five days a week, 10.00 am until 3.00 pm, they provide a local telephone advice line five days a week and are part of a Dorset wide CAB telephone advice service called Adviceline. Clients contact the CAB for advice on a range of issues including benefits, debt, housing, employment, tax, relationship and consumer issues. In terms of trends recorded by the CAB for 2013/2014, the top three enquiry areas are benefits, debt and housing. In terms of outcomes, the CAB is likely to achieve around £700,000 in financial gains for clients this financial year. In 2013/2014 they dealt with around 2200 new clients who presented with around 4000 different issues. They expect to see over sixty clients from the Broadwindsor area each year- just under 3% of their client group. 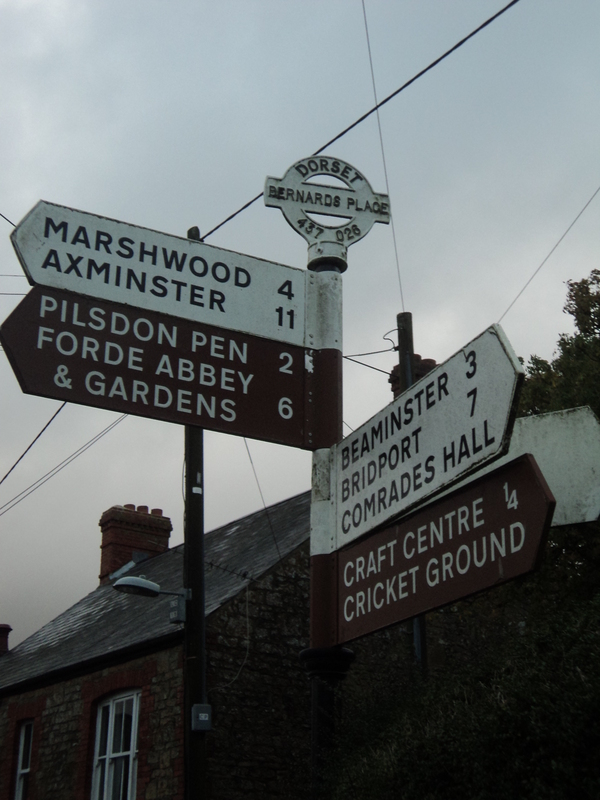 The CAB has recently been developing a new outreach service in Beaminster to try and improve access to the service. They are currently undergoing a service review with West Dorset Council and are involved in a number of recruitment drives to increase volunteer numbers. The CAB has been active in setting up a local advice network, bringing together other agencies in the area. Councillor Hibbard thanked everyone for attending the Meeting and Blackdown Village Hall for hosting the event. The Meeting was formally closed at 9.03 pm.